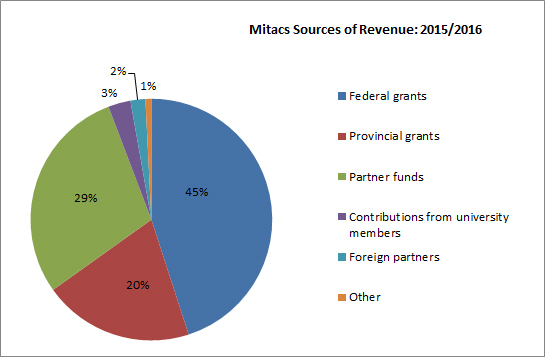 Mitacs programs are supported jointly by provincial and federal governments and agencies, industry and universities within Canada, as well as governments and universities overseas. The Board of Directors has fiduciary responsibility for all Mitacs operations. The Board works closely with the Mitacs Senior Management Team (SMT) to ensure the overall success of Mitacs in achieving its mission and vision. The Mitacs Research Council is responsible for overseeing research integrity of all Mitacs programs on behalf of the Mitacs Board. The Board of Directors and Senior Management Team of Mitacs are committed to prudent, sound corporate governance. Mitacs programs and activities are, by their very nature, entrepreneurial. As a key outcome of Mitacs programs is to increase business investment in R&D activities in Canada, Mitacs deploys business development resources, which are critical to achieving this goal. 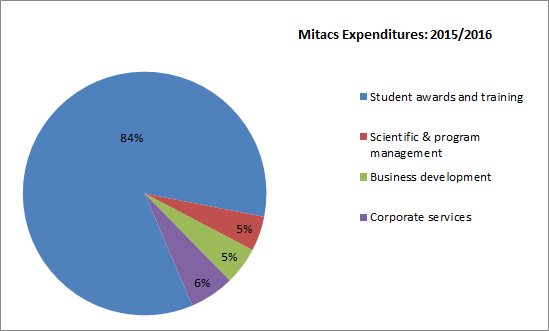 As a result, industry has invested approximately $127 million in research and development activities through Mitacs over the past 6 years. 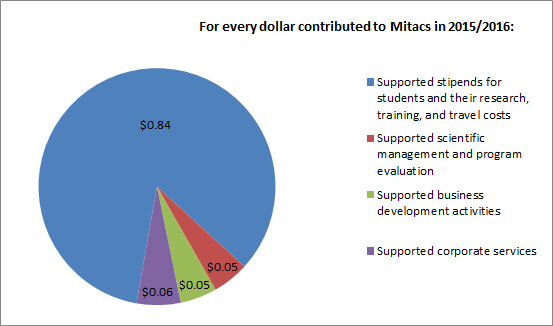 Mitacs is committed to keeping overhead costs low and to maximize the impact of funding received. *Mitacs administration costs include all peripheral administration costs that are often accounted for independently in other programs, including organizational management, policy, communications, evaluation etc.